Definition at line 1050 of file llviewerparcelmgr.cpp. Definition at line 1053 of file llviewerparcelmgr.cpp. 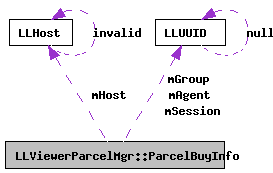 Referenced by LLViewerParcelMgr::sendParcelBuy(), and LLViewerParcelMgr::setupParcelBuy(). Definition at line 1064 of file llviewerparcelmgr.cpp. Definition at line 1069 of file llviewerparcelmgr.cpp. Definition at line 1055 of file llviewerparcelmgr.cpp. Definition at line 1059 of file llviewerparcelmgr.cpp. Definition at line 1058 of file llviewerparcelmgr.cpp. Definition at line 1056 of file llviewerparcelmgr.cpp. Definition at line 1070 of file llviewerparcelmgr.cpp. Definition at line 1062 of file llviewerparcelmgr.cpp. Definition at line 1063 of file llviewerparcelmgr.cpp. Definition at line 1057 of file llviewerparcelmgr.cpp. Definition at line 1054 of file llviewerparcelmgr.cpp. Definition at line 1068 of file llviewerparcelmgr.cpp. Definition at line 1067 of file llviewerparcelmgr.cpp.